Menulog delivers for Rudy's American so you'll be able to track your courier on a map. Rudy’s American hamburger, small side of french fries and soft drink. Simply cheesy, small side of french fries and soft drink. Double cheesy, small side of french fries and soft drink. Rudy’s American dog, small side of french fries and soft drink. 4 x simply cheesy burgers. 8 x simply cheesy burgers. Rudy's chicken nuggets, small side of french fries and soft drink. Make it a Meal comes with small side of fries and a choice of drink. 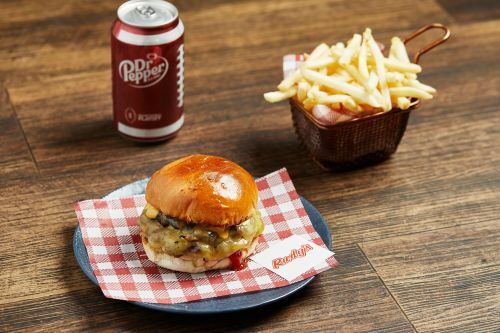 60g 100% Aussie beef patty, melted American cheese, ketchup, Rudy’s special sauce and pickle on a soft burger bun. 2 x 60g 100% Aussie beef patties, double melted American cheese, ketchup, Rudy’s special sauce and pickle on a soft burger bun. 60g 100% Aussie beef patty, diced onions, pickles, ketchup and Rudy’s special sauce on a soft burger bun. Rudy’s 6” American dog with melted cheese, ketchup, mustard and diced grilled onions in a soft hotdog bun. Rudy’s 6” American dog with tasty guacamole sauce, grilled onions, lettuce and Californian chilli hot sauce in a soft hotdog bun. Served with the choice of one dipping sauce: jalapeno BBQ, bourbon BBQ, special sauce, blue cheese, buffalo, sweet & sour sauce or honey mustard.